Clashes between Egypt’s security forces and supporters of former Egyptian President and Muslim Brotherhood leader Mohamed Morsi continue to capture the world’s attention, with hundreds dead and thousands injured. At the same time, Egypt’s Coptic Christians also have faced continued violence. As many as 52 churches were attacked throughout Egypt in a 24-hour period last week, according to some reports. Even before that, a statement condemning ongoing sectarian attacks was issued by 16 human rights groups. About a third (35%) of Egyptian Muslims say that all, most or many Muslims in their country are hostile toward Christians, according to a Pew Research Center survey of the world’s Muslims. And, about half (50%) of Egypt’s Muslims say that all, most or many Christians are hostile toward Muslims, the highest share in the 26 countries where the question was asked. The vast majority of Egyptians (about 95%) are Muslim, but according to 2010 Pew Research estimates, about 5% are Christian. In such a large country, that amounts to more than 4 million people – putting the group among the world’s 10 largest populations of Christians living as minorities. 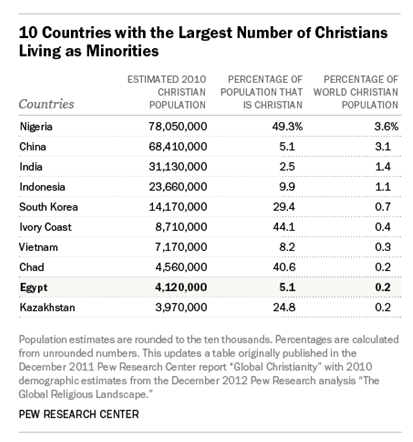 Media reports sometimes say that Christians make up a higher share of Egypt’s population. A number of factors make it difficult to find a consensus about the exact percentage of Egyptians who are Christian, as addressed in more detail in 2011 by Pew Research Demographer Conrad Hackett. But census and survey data show a gradual decline in Christians’ share of the population over most of the last century. Still, Egypt has by far the largest Christian population in the Middle East-North Africa region, where Christians are a minority in all 20 countries and territories. For details on the updated sources and methodology used in the above chart, see here.